Mirror's Edge was a bold and innovative experiment for EA, DICE, and gaming as a whole. Unfortunately, that doesn't always make something good. But for all of Mirror's Edge's unique ideas and vibrant atmosphere, it was deeply flawed. Perhaps the game's most enduring black mark is its combat. Though the game's marketing emphasized the "flight, not fight" aspect of its free-running in the run up to its launch, there are a lot of men with guns. Sometimes it's handled elegantly: A particularly beautiful piece of level design in the last mission has you fend off several of the toughest soldiers in the game with nothing more than a few kicks, for instance. But at many other times it locks you into a series of tighter and tighter spots until you're forced to disarm opponents, steal weapons and rely on your twitch-shooter reflexes. 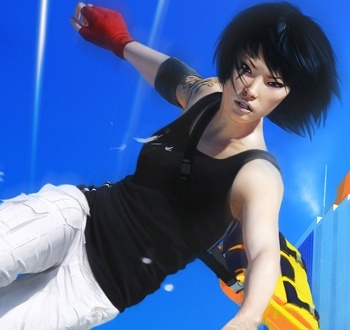 Mirror's Edge only works when it's being Mirror's Edge, and many gamers felt understandably let down when it forced them to play something else. To read more about why DICE's leap of faith fell just short of greatness, check out "Stumbling Through Mirror's Edge" in Issue 244 of The Escapist.